In the first chUrNai, SrI rAmAnuja elaborated about pirAtti’s ability to grant SaraNAgathi , his own inability to go to anyone else; he then performs SaraNAgathi to her lotus feet. She asks him as to what he desires. He responds saying that he wants involvement in kainkaryam (carrying out service to dhivya dhampathi) and to have complete belief in SaraNAgathi (our pUrvAchAryas call this as mahaviSvAsam). 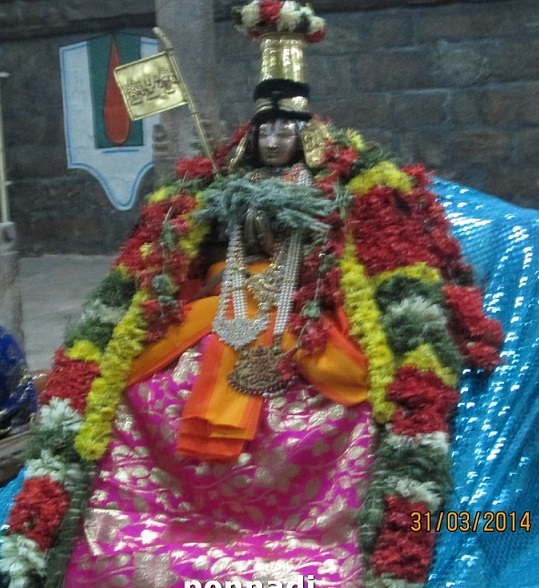 When a person performs SaraNAgathi to the lotus feet of perumAL, it also ensures that he gets to carry out kainkaryam. Even then, it is expected of a person who performs SaraNAgathi to the lotus feet of perumAL to have strong desire for kainkaryam and also possess strong belief in SaraNAgathi. Is it that SrI rAmAnuja did not have these two qualities (desire for kainkaryam and belief in SaraNAgathi) earlier? Compared to what the result is (after performing SaraNAgathi), i.e. getting to reach mOksham and performing kainkaryam, we have to think that we do not have anything in us to reach that goal. And this is true too. Moreover, our pUrvAchAryas always thought that they did not have anything good in them, out of naichyAnusandhAnam (thinking very lowly of oneself) in order to reach SrIvaikuNtam. pAramArthika – fully true; that which gives meaning to the parama purushArtham (highest degree of benefit). aikAnthika – nothing beyond this (Ekam – one; antham – end); bhakthi (devotion )only in thiruvadi (exalted feet) and nothing beyond this. pAramArthika – artham means both prayOjanam (end result) and truth. If it is used as an adjective for parabhakthi (paramArthika parabhakthi), pAramArhtika refers to bhakthi’s causelessness (nirhEthukathvam). In other words, if the bhakthi comes from bhagavan‘s blessings, it is sidhdha bhakthi, a bhakthi which comes readily to us without any effort from our part. If on the other hand we take efforts to get bhakthi, it is sAdhana bhakthi, a bhakthi which comes out of our efforts. If pAramArthika is taken as an adjective for charaNAravindham (lotus feet) (pAramArthika charaNAravindham), it refers to prayOjana thiruvadi i.e. attaining and enjoying the lotus feet for carrying out kainkaryam to lotus feet. bhagavach charaNa aravindha – the term bhagavAn is added here to highlight the superiority of his lotus feet. This indicates the sweetness that happens to the lotus feet due to the qualities of bhagavAn. Since his qualities are enjoyable, these lead to paramabhakthi which makes the enjoyment even more desirable. charaNa aravindha – the lotus feet are indicative of the entire physical being of bhagavAn and are hence enjoyable. aikAnthika – there is only one end; there is no second; i.e. not looking at anything beyond this. 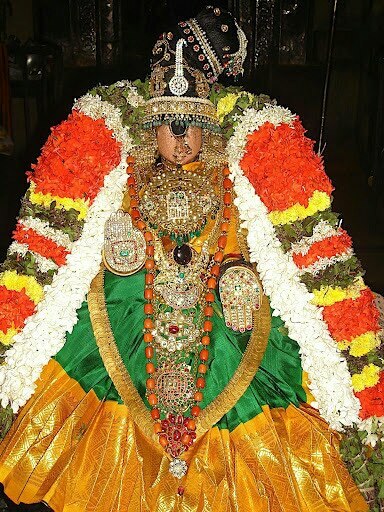 Athyanthika – focused on bhagavAn alone; not having bhakthi elsewhere and on bhagavAn too. parabhakthi – the prEmam (love) with bhagavAn is such that there is joy when being with him and sorrow when not being with him. paragyAna – parabhakthi stage blooms into seeing bhagavAn. Thus it is called dharSana sAkshAthkAram – i.e. having true vision of bhagavAn. paramabhakthi – the end stage of parabhakthi wherein it is impossible to be away from bhagavAn. Life ceases when separation happens. SrI rAmAnuja initially asked for gyAna, then bhakthi; with these two, bhagavAn takes him to the stage reached by bhakthi yOgi so that he attains paramabhakthi without having to go through the efforts put in by a bhakthi yOgi. Beyond this, SrI rAmAnuja desires other stages as explained below. paripUrNa – here it refers to the ability to experience bhagavAn‘s svarUpa, rUpa, guNa, vibhava – all at the same time, completely, without any hurdle. With our limited sensory organs, it is not possible even to think of enjoying these qualities of bhagavAn which are unlimited in nature. Only after attaining parabhakthi, paragyAna and paramabhakthi, can we enjoy these. anavaratha – experiencing and enjoying bhagavAn‘s qualities continuously, without any break. nithya – permanently; until such time that AthmA exists (since AthmA always exists, the experience also will be always existing). viSadha thama – the third stage of anubhavam or experience. First stage is viSadha which is attained through parabhakthi. The 2nd stage, viSadha thara is attained through paragyAna and the final, through paramabhakthi. ananya prayOjana – experiencing and enjoying bhagavAn‘s qualities without expecting anything in return. Not even the prIthi (love) born out of experience or kainkaryam resulting from prIthi. Experience bhagavAn only for the sake of experience and nothing else. bhagavadhanubhava – the experience that AthmA gets after it leaves behind the last physical form (in which it carried out SaraNAgathi) and reaches paramapadham (SrIvaikuNtam) through archirAdhigathi (the path that takes the AthmA through 12 different worlds before crossing vrajA river and getting into SrIvaikuNtam). The bhagavadhanubhavam that one gets on leelA vibhUthi (samsAram – material realm) is limited while at nithya vibhUthi (SrIvaikuNtam – spiritual realm) it is unlimited. janitha anavadhika athiSaya prIthi kAritha – the bhagavadhanubhavam gives birth to prIthi which is deep love that is always overflowing and is wonderful. nithya – the kainkaryam done is not just once or twice but for ever; permanently. The AthmA once it reaches SrIvaikuNtam, does not ever get back to earth for another birth. Hence it is kainkaryam that is there for ever. yathAvasthithA – as it is; i.e. leaving aside whatever should not be held (desire for worldly things) and holding on to what should be held (bhagavan’s lotus feet). Since this is rahasyam,(secret) he does not reveal here how to carry out SaraNAgathi. avirathAsthu mE – this should happen to me without any break or hurdle; i.e. having reached his lotus feet, and getting the opportunity to carry out kainkaryam, it should be there for me for ever without any break. Let us now move on to the 3rd and 4th chUrNai, which are very short. Both have been spoken by pirAtti, as a response to SrI rAmAnuja‘s first two chUrNais. Let it happen to you! Whatever you have prayed for, starting from parabhakthi to carrying out kainkaryam, with all the intervening stages such as paramagyAna, paramabhakthi etc, let it all happen to you! With this , we have completed the first part of SaraNAgathi gadhyam, in which SrI rAmAnuja first approaches pirAtti as a prelude to carrying out SaraNAgathi to bhagavAn so that she will perform her role of purushakAra bhUthai (one who recommends). Next he moves on to bhagavAn for performing SaraNAgathi. We shall see that from the 5th chUrNai. This entry was posted in gadhya thrayam, Other, SaraNAgathi gadhyam on December 4, 2015 by T N Krishnan.